When examining the connection between biomedical informatics, health data science, and medical AI, the relation is rather simple – both Medical AI and Health Data Science are sub-disciplines of Biomedical Informatics. Computer science and engineering: database, algorithm, programming, artificial intelligence, machine learning (including deep learning), neural network, cognitive computing, distributed computing, cloud computing, natural language processing and text processing, security, visualization, mobile devices, sensors, internet of things, social networks, etc. Within biomedical informatics, there is an emphasis on certain key processes; acquisition, storage, communication, processing, integration, analysis, mining, retrieval, interpretation, and presentation. These processes transform data to information to knowledge to intelligence; these are entities. Once researchers have entities for evaluation, the next step is to perform descriptive, predictive, and prescriptive tasks or functions. In general data science or informatics, these processes, entities, and functions can be applied to any domains. 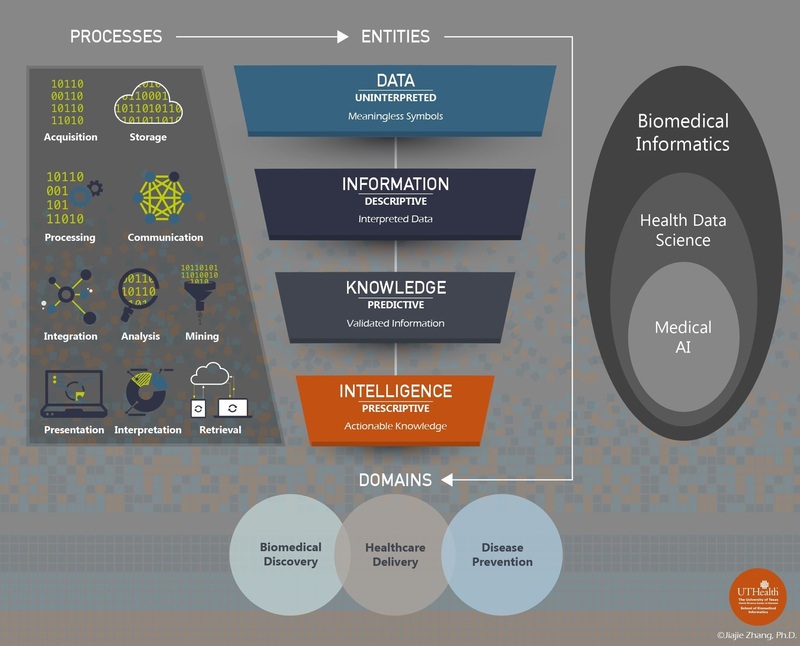 For biomedical informatics, the application domains are biomedical discovery, healthcare delivery, and disease prevention. Data is unintepreted, unprocessed, meaningless raw symbols, signals or pixels. For example, “101” could mean several things; the decimal number one hundred and one, the binary number five, the values of three pixels or even a label for a highway. Without context, most data types are meaningless. Information is interpreted data or data with meaning. For example, once we know that the metric for 101 is degrees in Fahrenheit, we immediate correlate the number to temperature. Information provides a descriptive function and tells you what happened, at what juncture and for whom. Knowledge is organized information that is justified or validated. Let’s say that we also know that 101 °F is an adult oral temperature. Immediately, we know that this indicates an abnormal body status (fever) and this relation is validated in medical practice and research. Knowledge provides a predictive function and tells you what might happen. An adult oral temperature of 101 °F predicts that the body status is irregular. Intelligence is actionable knowledge. An adult with a 101°F temperature should take fever medication, have further assessment and diagnosis performed and may need to see a doctor if it is not a simple cold. Intelligence provides prescriptive function and tells you what needs to be done. 101 °F adult oral temperature prescribes the action of taking fever medicine and further assessment. 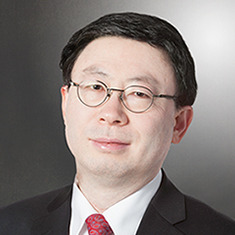 Dr. Zhang is Dean, Professor, and Glassell Family Foundation Distinguished Chair in Informatics Excellence at the School of Biomedical Informatics (SBMI) at the University of Texas Health Science Center at Houston (UTHealth).